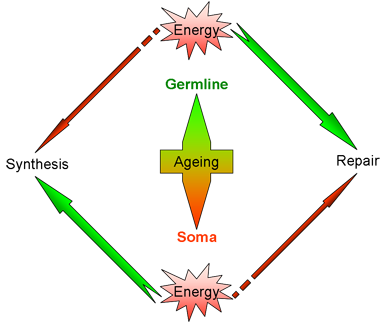 Ageing and senescence are complex processes that dramatically impact human health and society. Elucidation of the basic molecular mechanisms underlying the progressive decline in cellular function that accompanies ageing and eventually leads to senescence will have an immediate impact on the design of novel interventions that could reduce or delay age-related deterioration in humans. Marked alterations in cellular energy metabolism are a universal hallmark of the ageing process. The biogenesis and function of mitochondria, the energy-generating organelles in eukaryotic cells, are primary longevity determinants. Genetic or pharmacological manipulations of mitochondrial activity, profoundly affect the lifespan of diverse organisms. However, the molecular mechanisms regulating mitochondrial biogenesis and energy metabolism during ageing are poorly understood. Prohibitins are ubiquitous, evolutionarily conserved proteins, which form a ring-like, high molecular weight complex at the inner membrane of mitochondria (see this review). We have found that the mitochondrial prohibitin complex promotes longevity by modulating mitochondrial function and fat metabolism in C. elegans. Research in our lab revealed that the mitochondrial protein prohibitin is part of a novel mechanism regulating mitochondrial biogenesis and function, with opposing effects on energy metabolism, fat utilization and ageing in C. elegans. Prohibitin may play a similar key role in modulating energy metabolism during ageing in mammals. A model inspired by the “disposable soma” theory of ageing. In somatic tissues, more energy is relayed to biosynthetic activities and less is available for repair. In the germline, energy is mostly invested in maintenance and repair (see this perspective). Protein synthesis and degradation are the two essential interlinked cellular processes responsible for maintaining a functional protein content in every cell. A decrease in protein turnover is associated with senescent decline and ageing. In addition, caloric restriction, a feeding regimen that confers longevity, in which calorie intake is reduced without limiting vitamins, minerals and other essential nutrients, increases protein turnover. However, a direct molecular link between ageing and regulation of protein turnover has not been established. We exploit the experimental strengths of C. elegans in an effort to identify the specific biochemical steps underlying alterations of protein turnover during ageing and under caloric restriction. The rate at which a protein pool is refreshed at any given point in time is determined by the rate of protein synthesis and protein degradation at that particular point. The delicate balance between detrimental protein modification and protein turnover that exists early in life is tipped in favor of deleterious protein modification during late stages of life. 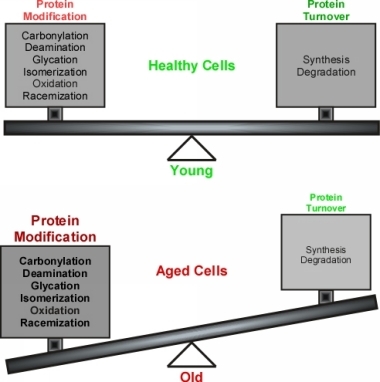 Protein turnover cannot keep up with ever-increasing accumulation of damaged proteins during ageing (see this review). Increased protein turnover might be one of the major causes of lifespan extension under caloric restriction or in long-lived mutants, by facilitating the maintenance of a fresher pool of proteins with less accumulated damage. Work with powerful genetic models that can be easily engineered such as C. elegans, should enable direct testing of the hypothesis that modulation of protein turnover rates is critical in lifespan and is a required component of caloric restriction. Our investigation focuses on the determination of those mutable steps of protein synthesis and degradation that can be altered to affect longevity, aiming to provide novel insight into the molecular mechanisms of ageing and cell survival. The molecules enacting these steps could constitute attractive pharmacological targets for therapeutic reversal of senescent decline. For more information, see these papers (1 | 2). See also a commentary in the Journal of Cell Biology, two relevant Press Releases (1 | 2) and some Press coverage bits: EKT-1, EKT-2, in.gr, Ta Nea, Eleftherotypia (1 | 2 | 3), Patris (1 | 2 | 3), Kathimerini (English), Ethnos, Flash, Nea Kriti.